BACKGROUND AND PURPOSE: Arterial fenestrations are associated with saccular aneurysms that are often difficult to treat with open surgical techniques. We evaluated our experience with endovascular treatment of such aneurysms. METHODS: Ten consecutive patients with 11 basilar artery aneurysms associated with fenestrations were treated with coils by means of the endovascular route between November 1994 and February 2000. All patients underwent endovascular embolization by the femoral approach, under general anesthesia. Twelve embolization procedures were perfomed in the 10 patients. RESULTS: Nine proximal and two distal basilar artery fenestration aneurysms were treated successfully. The embolization was complete in 10 of the 11 aneurysms. It was incomplete in one case, and complete occlusion could not be achieved at the second attempt. There was one regrowth at 1-year follow-up, which was successfully treated again. Four of the aneurysms were treated initially with balloon remodeling, whereas one aneurysm with regrowth and one with incomplete occlusion were treated with balloon remodeling at the second embolization procedure. In one case, one limb of the fenestration was sacrificed. CONCLUSION: Endovascular treatment of basilar artery aneurysms associated with fenestrations appears to offer advantages over traditional open surgical techniques. Intracranial saccular aneurysms associated with arterial fenestrations, although well known, are considered rare (1, 2). Similar to arterial bifurcations, arterial fenestrations resulting from developmental anomalies of brain arteries have a tendency to develop aneurysms (3). Surgery of basilar artery fenestration aneurysms may be difficult owing to the complex geometry of the fenestration, proximity of the lower cranial nerves, difficulty in obtaining adequate surgical exposure, and crowding of arteries in this region (4, 5). Endovascular treatment of intracranial arterial aneurysms is now a well-known procedure that is inherently very suitable for those aneurysms. The purpose of this study was to evaluate our experience with basilar artery fenestration aneurysms treated by means of the endovascular approach. Between November 1994 and February 2000, 10 consecutive patients (seven women, three men; mean age, 39.9 years; age range, 18–62 years) with basilar artery fenestration aneurysms underwent endovascular embolization. Of the 10 patients, seven had subarachnoid hemorrhage at presentation, and the other three sought medical attention for intractable headache. Among those with bleeding, at presentation two patients were Hunt and Hess grade 1, three patients were grade 2, and two patients were grade 3. One patient also had 6th cranial nerve palsy. One patient with previously ruptured aneurysm underwent an unsuccessful operation 2 years previously for the distal basilar artery fenestration aneurysm. CT was available in all patients, and MR imaging and MR angiography were available in three patients. Diagnosis was confirmed with four-vessel angiographic studies in all cases. Neck size of the aneurysms was determined on the angiographic projection that best displayed the neck region in relation to the parent arteries. All of the patients gave written, informed consent. In two of the patients, institutional review board approval was necessary and obtained, because these patients were treated during the GDC trial between 1994 and 1996. General characteristics of the patients, cerebral angiography findings, and treatment results are given in the Table. All patients underwent endovascular embolization by the femoral approach under general anesthesia. Twelve embolization procedures were performed in 10 patients. A coaxial system was introduced, after positioning of a 6F guiding catheter in one or both vertebral arteries. The microcatheters used for superselective catheterization were Rapid Transit (Cordis Europa N.V., Roden, the Netherlands) and Tracker-10 and -18 and Excel-14 (Boston Scientific, Target Therapeutics, Fremont, CA). High-resolution fluoroscopy was used simultaneously in conjunction with a road-mapping technique in each case. The patients were treated with Guglielmi detachable coils (GDCs; Boston Scientific, Target Therapeutics) as the embolic agent. The nondetachable balloon catheters used for balloon remodeling were Magellan (Balt, Montmorency, France), Cirrus (Medtronic MIS, Sunnyvale, CA), Solstice (Medtronic MIS), and Equinox (Microtherapeutics, Irvine, CA). The adequacy of systemic anticoagulation was monitored by frequent measurements of the activated clotting time (ACT). A baseline ACT was obtained before bolus infusion of heparin (50–75 U/kg body weight) and hourly thereafter. The bolus infusion of heparin was followed by a continuous drip (1000–1500 U/hr), with the purpose of doubling the baseline ACT. For the following 5 days, subcutaneous low-molecular-weight heparin was administered. Angiographic studies were obtained immediately after embolization and at the 1st year of follow-up. At 3-month intervals after embolization, anteroposterior and lateral projection cranial radiographs were obtained to evaluate any change in the configuration of the coil mesh. A follow-up angiogram was obtained immediately after radiography if there happened to be any change in the configuration of the coil mesh seen on the radiographs, or at 1 year if the radiographs were normal. The angiographic result was rated as a percentage of occlusion based on the neck remnant and sac opacification. If both the sac and neck were densely packed, the aneurysm was then judged to be completely obliterated. It was accepted as incomplete if a neck remnant was present and any opacification was seen in the coil mesh. The fenestrations were at the proximal basilar artery in eight patients and at the distal basilar artery in two patients. The aneurysms were located at the proximal part of the fenestration in all patients. In nine patients, a single aneurysm accompanied the fenestration, whereas in one patient the fenestration was accompanied by two aneurysms in the proximal part. The aneurysms ranged in angiographic size from 3 to 14 mm. Five of the aneurysms were wide necked, since the body-to-neck ratio was close to 1. The other six were narrow necked. No branches originated from the aneurysms. Ten aneurysms were located at the proximal bifurcation, and one aneurysm was located at the right loop. Seven patients with acutely ruptured aneurysms were treated within 3 days, whereas three patients with unruptured aneurysms were treated under elective conditions. Except for one patient, none of the other patients underwent surgical treatment before and/or after embolization. All the aneurysms were successfully catheterized and embolized by using the GDC system. Three-dimensional GDCs were used in two aneurysms as the initial coil. These two aneurysms were the last ones treated. The rest of the aneurysms were treated with other available GDC types. Nine of the aneurysms were treated solely with the GDC-10, one with the GDC-18, and one aneurysm with both the GDC-10 and GDC-18. 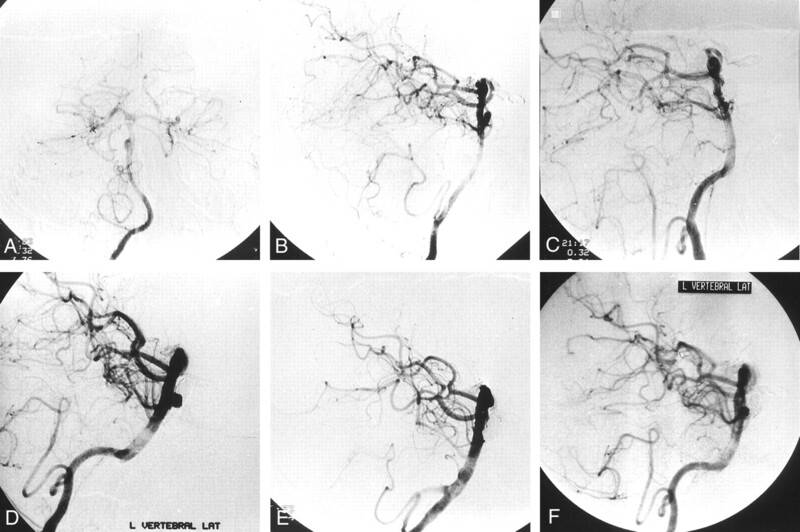 Of the 11 aneurysms, complete embolization was achieved in 10. In one aneurysm, embolization was incomplete, with a neck remnant. At 5-year follow-up, coil compaction was noted. The aneurysm was successfully catheterized; however, again complete occlusion could not be achieved (Fig 1). 35-year-old woman with intractable headache. A and B, Lateral (A) and oblique right (B) vertebral artery angiograms show a large-neck aneurysm. C, Right vertebral artery oblique projection demonstrates residual filling after initial attempt. D, Left vertebral artery injection image after the last embolization session demonstrates persistence of residual filling. Balloon remodeling technique was used in six patients, three of whom had wide-necked aneurysms (Fig 2). In the patient in whom one loop was sacrificed, the balloon catheter was used to protect the basilar artery and the other loop of fenestration. In one patient, balloon remodeling was successfully used at closing down the regrowing aneurysm (Fig 3). In the case with incomplete embolization, balloon remodeling was used at the second procedure 5 years later. Four patients did not require balloon remodeling (Fig 4). 34-year-old man with Hunt and Hess grade 2 subarachnoid hemorrhage. A, Right vertebral artery anteroposterior projection reveals a proximal basilar fenestration associated with aneurysm. B, Fluoroscopic image during deployment of last coil shows neck remodeling. C, Postembolization right vertebral artery injection image confirms total occlusion of the sac and patency of both loops of the fenestration. 30-year-old man with subarachnoid hemorrhage at presentation in 1994. A and B, Digital subtraction angiograms in anteroposterior (A) and lateral (B) projections demonstrate a fenestration and an associated aneurysm. C, Follow-up angiogram in lateral projection after GDC treatment shows total occlusion. D, Angiogram obtained 6 months later reveals recanalization due to coil compaction. E and F, Follow-up angiogram immediately after treatment (E) shows total occlusion of the aneurysm, which turned out to be partially recanalized on the 1-year follow-up angiogram (F). 41-year-old woman who presented with serious headaches. A, Right anterior oblique projection shows a fenestration associated with an upwardly projecting midbasilar artery aneurysm. B, Immediately after GDC occlusion, right anterior oblique angiogram confirms total occlusion. C, One-year follow-up lateral angiogram shows that the occlusion is stable. In all cases, we attempted to preserve both loops of the fenestrations; however, in one case, one of the loops of the fenestration was intentionally sacrificed. In this case, the aneurysm was found to be originating from the lateral wall of the fenestration. The coils could not be stabilized in the aneurysmal sac, and the aneurysm along with the fenestration loop was closed down with coils (Fig 5). 62-year-old woman with a Hunt and Hess grade 3 subarachnoid hemorrhage at presentation. A, Left vertebral artery angiogram demonstrates fenestration and large-neck bilobed aneurysm at the proximal part. Note mild vasospasm of the basilar artery. B and C, Postembolization left (B) and right (C) vertebral artery injection images show total occlusion of the aneurysm and smaller right-sided daughter branch of fenestration. No complications related to the embolization procedures occurred. No new neurologic deficit was seen in any patient after the embolization procedures, and the patients returned to work and to an unrestricted lifestyle and were considered to have an excellent outcome. Sixth cranial nerve palsy of one patient persisted after complete occlusion of the aneurysm. The mean follow-up period was 31.1 months (range, 10–73 months). First-year follow-up angiography was available in five patients. Fifth-year follow-up was available in two patients. The basilar artery is formed by fusion of paired fetal longitudinal neural arteries around the 5–9-mm fetal stage. When the paired longitudinal neural arteries fail to fuse, fenestration may occur anywhere along the course of the basilar artery (6). The most frequent site of basilar artery fenestration is in the proximal portion (7). The middle or distal part of the basilar artery is rarely affected. In two of our patients, the fenestration and the associated aneurysm were located in the distal portion. Fenestration of an intracranial artery is a rare anomaly. After the vertebral artery, the basilar artery is the second most frequent site of fenestration of intracranial arteries (8). The true frequency of fenestration of the basilar artery is difficult to ascertain, and the data vary according to type of series, whether pathologic frequency (from 1.3% to 5.3%) (5, 9) or angiographic frequency (from 0.022% to 0.6%) (10, 11). We found at our institution 26 (1.3%) intracranial artery fenestrations on retrospective review of 2000 angiograms. Of the 26 arterial fenestrations, 20 (77%) were located at the basilar artery, three (12%) at the vertebral artery, and three (12%) at the middle cerebral artery. The higher frequency of fenestrations located at the posterior circulation in our study is due to referral of cases to our institution by other centers. The discrepancy between the autopsy frequency and angiographic frequency of basilar artery fenestrations can be explained by the fact that in some fenestrations the divider is very thin and in most projections is angiographically occult. In our experience, fenestrations associated with small aneurysms can be detected easily with detailed angiographic examination. However, when an aneurysm of this type is large, or the fenestration is subtle, it may obscure one of the loops associated with the fenestration and may prevent angiographic recognition (12). The new radiologic techniques such as CT angiography, MR angiography, and especially 3D digital subtraction angiography can be helpful in accurate pretreatment diagnosis. We did not have the opportunity to use these new techniques. During treatment of those aneuryms, we noted a helpful sign to detect the fenestration. When fenestration associated with aneurysm is under consideration, and the balloon remodeling technique is used, a dumbbell-shaped deformation may be seen during inflation of the balloon. Therefore, the first inflation should be performed under road-map guidance and must be very gentle in order to detect an unnoticed fenestration and prevent possible rupture. Finlay and Canham (13) studied arterial fenestrations and showed that the lateral walls of the fenestrated artery have a normal intrinsic architecture. The media is absent locally, with discontinuity of elastin at the proximal end of the fenestration. The subendothelium is thickened distally and thinned proximally. These structural changes at the proximal end of the fenestration are similar to those seen at cerebral artery bifurcations. The anatomic, structural, and hemodynamic changes that occur at the proximal end of the fenestration are consistent with the theory of the cause of intracranial berry aneurysms, as proposed by Stehbens (14). Although most of the aneurysms with fenestration are reported to be located at the proximal part, they can occur anywhere. Andrews et al (15) and Fujimura et al (16) reported such cases with basilar artery fenestration in which the aneurysm was located at the distal portion. Meanwhile, Campos et al (17) reviewed 59 aneurysms of the vertebrobasilar junction and found 21 (35.5%) to be associated with a fenestration at the proximal basilar trunk; all were located at the proximal end of the fenestration, showing high likelihood of presence of an aneurysm on the fenestration and its predilection toward a proximal location. The surgical approach to basilar artery aneurysms with fenestration is said to be difficult whether the approach is subtemporal, transoral-transclival, or suboccipital (1, 5, 18). The complex anatomy of this region includes multiple small perforating arteries to the brain stem and multiple lower cranial nerves. This complex anatomy and the difficulty of adequate surgical exposure make surgical clipping very difficult (5, 7, 18). In the study by Campos et al (17), 20 basilar artery fenestration aneurysms were surgically treated and 17 aneurysms could be clipped, with total occlusion in 14 (70%) and incomplete clipping in three (15%). In 13 cases (65%), the patients had postoperative transient lower cranial nerve palsies; one had permanent severe neurologic deficit, and one patient died. Other reports of surgical treatment of basilar artery fenestration aneurysms are generally restricted to a few cases (1, 5, 7, 18). Most authors mention the difficulty with the surgery and have tried different surgical approaches. Kobayashi et al (19) also emphasized the restriction of the surgical view and the working space. The approach chosen was dependent mostly on the location of the aneurysm and the relation of the aneurysm to the parent artery. Regardless of surgical exploration, the surgical view and the working space happened to be somewhat restricted. Endovascular embolization of cerebral artery aneurysms is now a well-known and alternative treatment to surgery (20, 21). As with other intracranial aneurysms not associated with fenestration, basilar artery fenestration aneurysms can also be treated endovascularly with GDCs. When reviewing the English literature, we found only four articles regarding endovascular embolization of basilar artery aneurysms associated with fenestrations. Three of these reports dealt with the use of GDCs in these aneurysms. Tasker and Byrne (22) reported on nine cases of fenestration of the basilar artery in which the aneurysm arose at the site of the fenestration in six case. 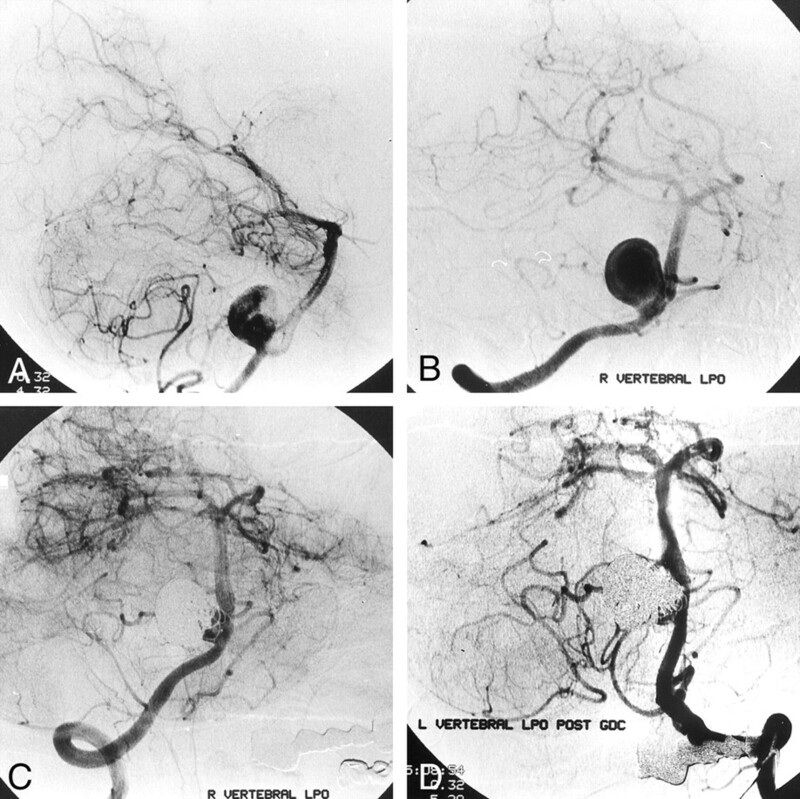 Four of these aneurysms were successfully treated with coils. However, technical details of the treatment were not discussed in the article. Graves et al (12) reported on three cases with basilar artery fenestration aneurysm. They achieved complete occlusion in two cases, whereas incomplete embolization was seen in one case owing to failure of catheterization of the aneurysm at a subsequent attempt because of the tortuous aorta and neck vessels. In one case, thrombosis occurred at one loop of fenestration and the distal basilar artery and was treated successfully with intraarterial urokinase infusion. This treatment complication resulted in no deficit. Nagashima et al (23) reported on one case with complete embolization with GDCs. Picard et al (24) reported on two cases with proximal basilar artery fenestration aneurysms that were treated endovascularly with detachable latex balloons, during the precoil era. They also achieved complete occlusion of the aneurysms. One of the patients died on the 6th postembolization day from pulmonary emboli. Our study of 11 endovascularly treated aneurysms, although small, to the best of our knowledge, is the largest reported study to date. The main factor limiting endovascular treatment of intracranial aneurysms is the shape of the aneurysmal sac, particularly the width of the neck (25). Although standard GDC treatment is used extensively, one major limitation is the inability to completely occlude wide-necked aneurysms with dense coil packing while maintaining parent artery integrity. Moret et al (26) in 1997 discussed the possibility of treating these difficult lesions with balloon protection. This method is an endovascular technique for treatment of wide-necked cerebral aneurysms with use of GDCs and a simultaneous temporary balloon, for which they coined the term “remodeling technique.” The remodeling technique allows the treatment of wide-neck or badly shaped aneurysms that are not suitable for the standard treatment. When the balloon remodeling technique is used, both vertebral arteries are catheterized, and good perfusion must be provided to avoid complications. In our study, three of the aneurysms initially required the balloon remodeling technique to successfully deliver the coils, owing to the complex relation of the aneurysm and the fenestration and insufficient body-to-neck ratio. One patient with a distal basilar artery aneurysm with regrowth (patient 6) required balloon remodeling in the second procedure, since the fundus of the regrowing aneurysm was small and the neck was large. In the case with incomplete embolization (patient 3), at the first embolization attempt, balloon remodeling microcatheters were not available. This wide-necked aneurysm became treatable with the advent of balloon remodeling catheters, and remodeling was used at the second attempt 5 years later. One patient was treated with sacrifice of one loop (patient 1) because of the complex relation of the aneurysm to the main artery and small size of the loop. In this case, the balloon catheter was used to protect the fenestration and the basilar artery. The remodeling technique thereby extends the spectrum of treatable aneurysms, with a lower risk incurred by treatment and fewer complications related to the technique. In all other cases, we preserved both loops of the fenestration. The loops of the fenestration should be preserved whenever an angiographically visible branch originates from the loop. However, small nonvisible branches may be present, and sacrifice may cause neurologic complications; fortunately, this did not occur in our case. Fujimura et al (16) treated one case with surgical clipping of one loop of the fenestration without complications. If angiographic proof indicates that there are no originating branches from the loop of fenestration, and if the balloon remodeling technique is thought to be too risky because of a complex anatomic relationship, the loop can be sacrificed. The regrowth of an aneurysm previously treated with coils is now a known problem (27). Aneurysm regrowth is most likely when the aneurysm has a wide neck and the hemodynamics of the parent artery direct high-pressure, pulsatile flow into the coils. Also, the luminal size of the aneurysm and possibly the degree of luminal packing influence the occurrence of regrowth (28). Therefore, in wide-necked aneurysms, complete angiographic occlusion should be provided, whenever possible, to prevent regrowth. For that, 3D coils appear to be helpful, since they offer a good basket for the subsequent coil mesh and allow the aneurysm to be filled densely with coils while preventing protrusion of the loops into the parent artery. If the aneurysmal regrowth is wide necked, then the remodeling technique can be used to safely deliver the coils. A wide-necked regrowth was observed in one patient at 12-month follow-up and required further treatment with balloon remodeling. In spite of these unwilled situations, endovascular treatment has the inherent capacity to retreat the aneurysms by the same route. As reported previously (29), management is possible in these cases by means of a second procedure. Even though multiple attempts and treatment with GDCs may have a lower risk than that of surgical exposure and clipping, we cannot say multiple attempts carry the same risk as a single attempt. Every intracranial aneurysm is potentially treatable by using GDCs with or without balloon assistance, in cases in which an available access is provided. However, problems may arise in providing access to the aneurysm. Tortuosities of the iliac, subclavian, and vertebral arteries may make the access difficult. Basilar artery fenestration aneurysms are rare. Surgery is difficult because of the complex anatomy, presence of small perforating arteries, lower cranial nerves at this region, and coexistent medical problems. Our series is small, but when evaluated along with previously reported cases, our results support endovascular management, which appears to have higher success and lower complication rates compared with those of surgery, especially when coupled with the remodeling technique. Stehbens WE. Etiology of intracranial berry aneurysms. J Neurosurg 1989;70:823–831. Accepted after revision March 4, 2002.